Arterial blood gas (ABG) analysis evaluates gas exchange in the lungs by measuring the partial pressures of oxygen (PaO2) and carbon dioxide (Paco2) as well as the pH of an arterial sample. Pao2 measures the pressure exerted by the oxygen dissolved in the blood and evaluates the lungs’ ability to oxygenated the blood. Paco2 measures the pressure exerted by carbon dioxide dissolved in the blood and reflects the adequacy of ventilation by the lungs. The pH measures the bloods hydrogen ion concentration and is carbonate (HCO3-) is a measure of the bicarbonate ion concentration in the blood, which is regulated by the kidneys. Oxygen saturation (Sa02) is the oxygen content of the blood expressed as a percentage of the oxygen capacity which is the amount of oxygen then blood is capable of carrying if all of the hemoglobin [Hb] were fully saturate). Oxygen content (o2CT) measures the actual amount of oxygen in the blood and isn’t commonly used in blood gas evaluation. To evaluate the efficiency of pulmonary gas exchange. To assess the integrity of the ventilatory control system. To determine the acidbase level of the blood. Explain the arterial blood gas analysis evaluates how well the lungs are delivering the oxygen to the blood and eliminating carbon dioxide. Tell the patient that the test requires a blood sample. Explain to the patient, who will perform the arterial puncture, when it will occur, and where the puncture site will be; radial, brachial, or femoral artery. Inform the patient that he may not need to restrict food and fluids. Instruct the patient to breathe normally during the test, and warn him that he may experience a brief cramping or throbbing pain at the puncture site. Use a heparinized blood gas syringe to draw the sample. 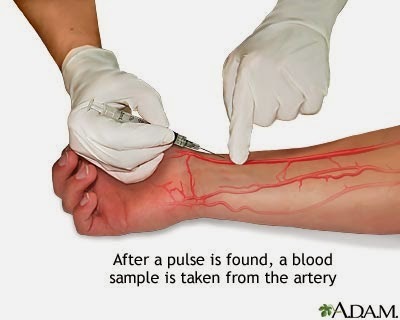 Perform an arterial puncture or draw blood from an arterial line. Eliminate air from the sample, place it on ice immediately, and prepare to transport for analysis. Note the flow rate of oxygen therapy and method of delivery. Note the patient’s rectal temperature. After applying pressure to the puncture site for 3 to 5 minutes and when bleeding has stopped, tape a gauze pad firmly over it. If the puncture site is on the arm, don’t tape the entire circumference because this may restrict circulation. If the patient is receiving anticoagulants or has a coagulonopathy, apply pressure to the puncture site longer than 5 minutes if necessary. Monitor vital signs and observe for signs of circulatory impairment. Normal ABG values fall within this ranges. Low Pao2, O2CT, and Sao2 levels and a high Paco2 may result from conditions that impair respiratory function, such as respiratory muscle weakness or paralysis, respiratory center inhibition (from head injury, brain tumor, or drug abuse), and airway obstruction possibly from mucus plug or a tumor. Low readings may result from bronchiole obstruction caused by asthma or emphysema, from an abnormal ventilation perfusion ratio due to partially blocked alveoli or pulmonary capillaries, or from alveoli that are damaged or filled with fluid because of disease, hemorrhage, or near drowning. When inspired air contains insufficient oxygen, Pao2, O2CT, and Sao2 decrease, but Paco2 may be normal. Such findings are common in pneumothorax, impaired diffusion between alveoli and blood. Low O2CT – with normal Pao2, Sao2 and, possibly, Paco2 values – may result from severe anemia, decreased blood volume, and reduced hemoglobin oxygen carrying capacity. Wait at least 20 minutes before drawing arterial blood when starting, changing, or discontinuing oxygen therapy. After initiating or changing settings of mechanical ventilation or other extubation. Before sending the sample to the laboratory, note on the laboratory request whether the patient was breathing room air or receiving oxygen therapy when the sample is collected. Exposing the sample to air increase or decrease in Pao2 and Paco2. Venous blood in sample possible decrease in Pao2 and increase Paco2. Use of Diamox, Macrodantin, and Tetracycline may decrease Paco2. Fever may cause false-high Pao2 and Paco2. Bleeding from the puncture site.